These latest test results complement the Top Safety Pick+ rating previously given to the 2015 Chrysler 200 by the Insurance Institute for Highway Safety (IIHS). “The Chrysler 200’s superior performance in such safety tests validates our continuing efforts to deliver the latest advancements in both passive and active safety technologies,” says Scott Kunselman, Chrysler Group’s Senior Vice President and Head of Vehicle Safety and Regulatory Compliance. Passive safety systems help mitigate the effects of a crash; active systems help drivers prevent crashes. Approximately 65 percent of the all-new Chrysler 200’s body structure consists of hot-stamped, high-strength, advanced high-strength and boron steels. Such construction helps maintain the vehicle’s integrity during collisions. “The 200’s active-safety equipment shatters the barrier that once restricted advanced driver-assist systems to expensive luxury-brand vehicles,” Kunselman adds. Among the active safety systems available on the 2015 Chrysler 200 is Full-speed Forward Collision Warning-Plus. It combines camera and radar technologies, which is a first for a mainstream-brand mid-size sedan. Such redundancy affords greater object-detection precision. Similar systems on competitive vehicles feature one technology or the other. Full-speed Forward Collision Warning-Plus provides alerts, autonomous braking and, under certain circumstances, slows or brings the all-new Chrysler 200 to a full stop when a frontal collision appears imminent. NHTSA’s safety ratings web page awards special designations to vehicles equipped with active safety systems, though the systems do not factor into the ratings. Collision-warning systems are a prerequisite to achieve IIHS Top Safety Pick+ status. The all-new 2015 Chrysler 200 boasts 60 safety and security features – the most in its class. Among these is the segment-exclusive Electronic Park Brake (EPB) with SafeHold. Offered as standard equipment, EPB with SafeHold automatically activates the 200’s parking brake if the driver’s seatbelt is unlatched and his or her door is opened while forward or reverse gears are engaged. This feature is designed to prevent rollaway situations. The all-new 2015 Chrysler 200 also notched four stars in NHTSA’s rollover resistance evaluation, which is calculated using vehicle dimensions. This result contributed to the car’s overall five-star rating. NHTSA is the only safety agency that evaluates rollover resistance. Launched in May, the all-new 2015 Chrysler 200 charts a new course for mid-size sedan customers. It leapfrogs expectations for a mid-size car with its elegant exterior design and thoughtful, beautifully crafted interior. The all-new 2015 Chrysler 200 delivers an exceptional driving experience, enabled by features such as a segment-first nine-speed automatic transmission – which comes as standard equipment – and an available, best-in-class all-wheel-drive system. Further, it boasts a highway-cycle fuel-economy rating of 36 miles per gallon. 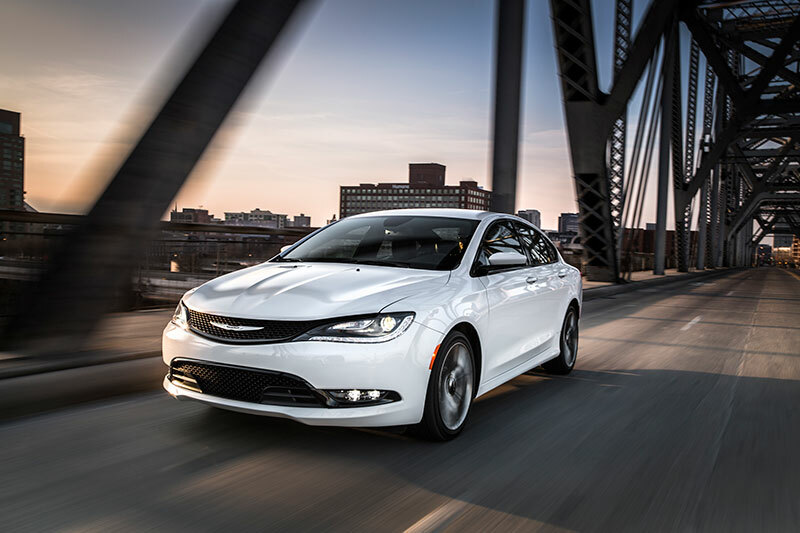 The all-new 2015 Chrysler 200 is designed, engineered and built with pride at Chrysler Group’s Sterling Heights Assembly Plant. Chrysler Group invested more than $1 billion in facility upgrades to produce the all-new 2015 Chrysler 200, including an all-new paint shop and a new, fully robotic body shop.